JReport Designer is a 100% Java, Swing-based report design tool that facilitates rapid report development, precise layout, flexible output, and actionable reporting. JReport Designer empowers developers with the ability to quickly build reports that efficiently deliver information to end users via any Web browser. With JReport, designing even the most sophisticated reports is intuitive, utilizing drag-and-drop or wizards that guide designers through the entire process of report creation. In addition, reusable components expedite the design process by providing a central location for sharing and editing commonly used objects. A WYSIWYG interface and view-during-design feature enables users to view report outputs (including data) exactly as they will appear, from within the design environment. JReport offers Flow Layout, Tabular Layout and Banded Layout. In all three layout schemes, the report designer has complete control over the precise location of report objects and components. JReport 8 is the first reporting tool to offer all three report layout schemes in a single product. 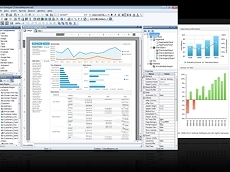 The report designer can choose a singular or combination of layout schemes to best present the data to the end user. JReport Designer can display information from any data source, including user-defined and hierarchical data sources, enabling enterprises to quickly and easily report on data from anywhere in their organization. Pixel-perfect layout, pre-defined and customizable styles, and over 50 chart types allow for creation of reports with any look and feel. Once designed, reports are published to the JReport Enterprise Server for on-demand viewing, analyzing, scheduling, or versioning. Multiple reports may be combined into a single report set that reuses a data set for improved report generation performance. Reports can be exported to a variety of formats from a single template, including DHTML, HTML, PDF, Excel, XML, RTF and CSV. Security permissions can be assigned to give specific, granular results to each end user.